boil the water and take of heat. steep the herb in the boiling water until the water looks like tea. strain tea and enjoy. DO NOT SWEETEN, I WILL STRAP YOUR HANDS IF YOU DO!!! 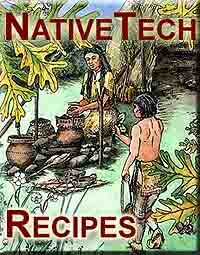 If you would like to contribute your own Native American or First Nation's recipe to this database, please send it to me through an email by clicking on the 'Contact Us' link above. This site is hosted by NativeWeb. Your donations to Nativeweb help them to promote Indigenous resources, inform the public about Indigenous cultures and issues, and to facilitate communications between Indigenous peoples and organizations supporting their goals and efforts. Please see their donation page to find out ways you can help.